Kennsington Golf Club is an 18-hole, par 71 championship golf course nestled on 225 acres within the Westford Lifestyle Community in Canfield, Ohio. Established in 2006, this beautiful and challenging golf course has contributed to the prestige of Westford and has helped make Westford the most desired community to reside in the surrounding Mahoning Valley area. Designed by award winning golf course architect, Brian Huntley, Kennsington offers an incomparable golf experience with the large ravines, aged woods and impeccable greens. Kennsington offers a beautiful setting to host your next golf outing, wedding, or your next large event. A full service practice facility and range is also available. The facility offers large, spacious areas to practice your drives and a putting green to work on your putting and chipping. Enjoy a great meal and a cold bevarage after a round of golf! Cheer on your admired sports teams on the 9 different HD TVs strategially placed around the bar! 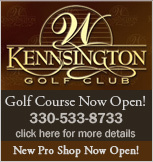 To book your next tee time, golf outing or event please call the pro-shop at 330-533-8733.